DECKED BED - The Topper Shop Inc. Hunting big game, waterfowl, even snipe requires a bevy of gear. 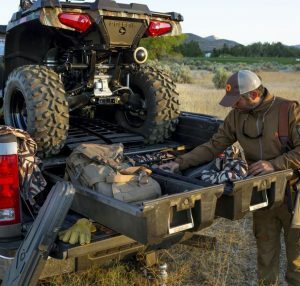 DECKED’s weatherproof and secure drawer system is designed to store your guns, ammo, decoys, cold beers and even that last lunch your wife will ever pack for you. Use the accessory drawer trays and dividers to dial in your system for whatever game you are pursuing. With DECKED you get all this storage and can still load up the bed with your ATV/motorcycles or set it up as your place to crash after a long day or late night arrival at camp.